We're excited to share with you our latest Phone-A-Friend adventures. We're traveling virtually to New Hampshire this fine Friday to help Amily with her nursery. Amily also happens to be Brinie's sister and she is expecting a little one in June, hooray! 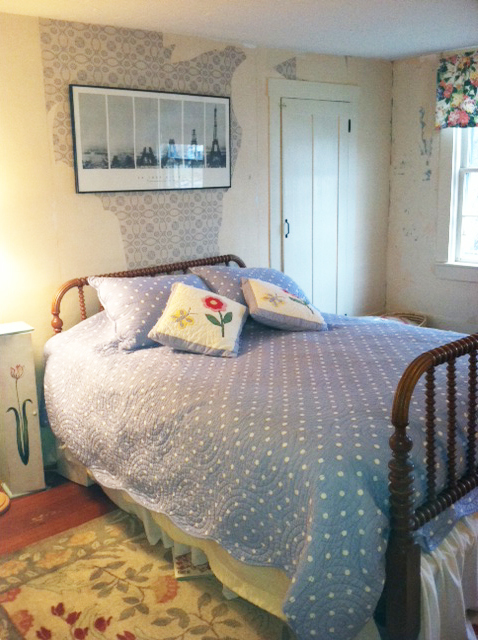 This room has been our guest room and it is not used very much. However, it is going to be converted into a nursery with a guest room option (we don't have overnight guests very often, but when we do, I want them to have a place to stay). Our house is an 1810 white with black shutters colonial. We live in an historic district. The crib we will be putting in the room is the same medium wood color (as the furniture in the photos below). 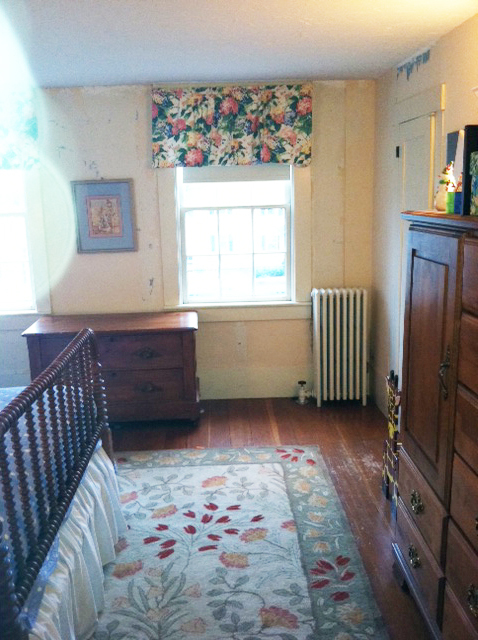 The bedspread, rug, and furniture stay. Suggestions on wall color (we'd like to paint it light yellow) and trim, curtains, and wall hangings is appreciated. I like whimsy over contemporary because of the style and age of our house. If we can fit a small rocking chair in the room, that would be great, but it needs to be petite. 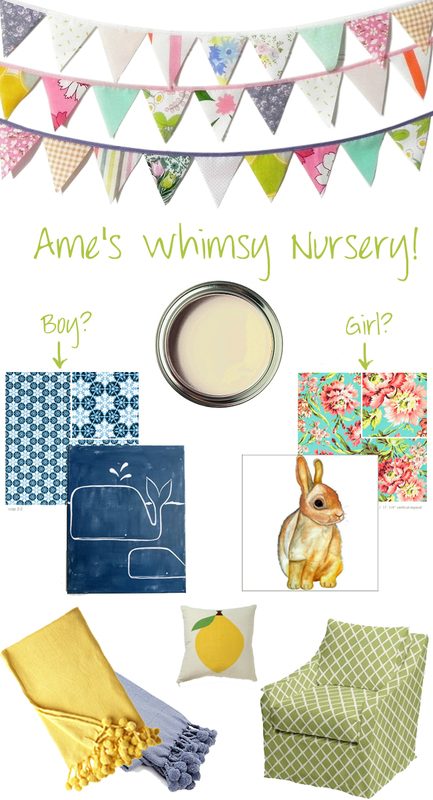 To Amily we say: Weeeee is for Whimsy! To be completely honest, a historic home and mystery about the gender was an exciting challenge, so we decided to find an inspirational nursery to use as a focus. Here's the one we fell in love with. 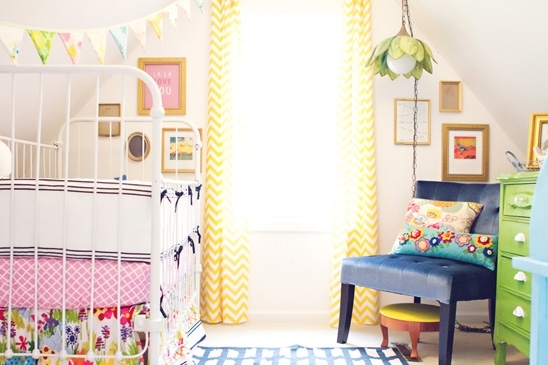 With a few color/fabric changes, this could very easily be a baby boy or girl room. Too cute! 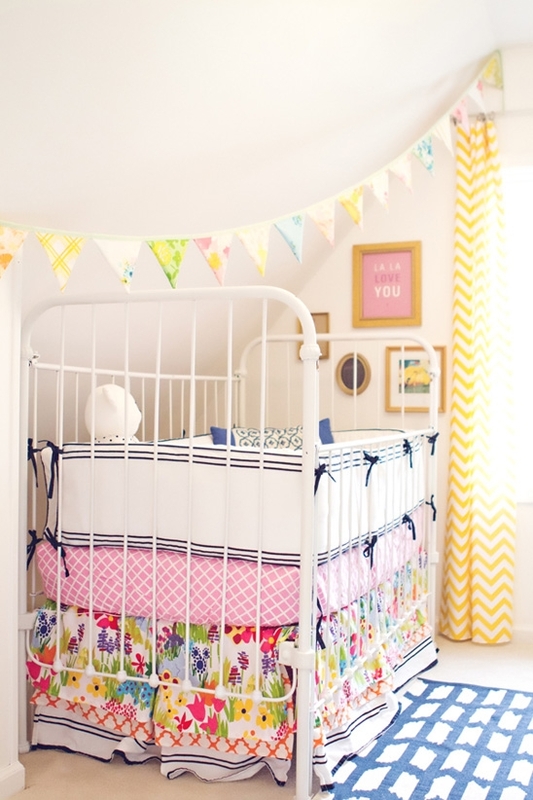 We love this, triple bed skirt and all! Bunting via Etsy: Fun alternative to a mobile, great way to incorporate colors. Boy fabric from Amy Butler: fun but not too modern. Great for crib bedding and curtains! Boy Artwork from Etsy: Could be great in a girl's room too, of course! Girl fabric also from Amy Butler: You can layer several of these coordinating fabrics for crib bedding and curtains. Sweet sweet bunny from Etsy: For some reason Blythe loves this little guy and might buy him for her house! Lemon pillow from Jonathan Adler: We think you should incorporate some yellow on the bed, this is one great punch! Pom-Pom blankets: All over the internet in every color. These are solid color, but a pom-pom defines whimsical. Yellow and blue. Amily, we are so excited for you and can't wait to find out if the boys are going to get a little brother or little sister! I jut wanted to say thank you for featuring my painting in your design recommendation! Your blog is lovely!